Jeremy Roenick played 20 years in the NHL, and was known for his fast skating and flashy offense. He appeared in 9 All-Star Games, scored over 500 goals and over 700 assists in his career. Here is a look back at his career–in cards–of the man known as “JR”. 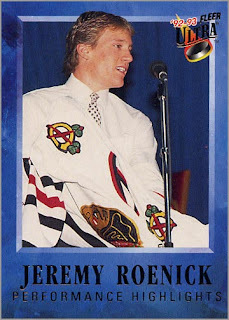 June 11, 1988 – The Chicago Blackhawks draft Jeremy Roenick in the 1st Round, 8th overall, in the 1988 NHL Entry Draft (as shown on this 1992-93 Fleer Ultra card). Roenick starts the season with the Blackhawks, scoring 18 points (9G, 9A) in 20 games. After that, he tallies 70 points for Hull in the QMJHL in only 25 games, and later 16 points in 7 games for Team USA at the World Junior Championships. 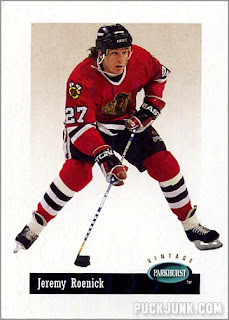 He then returned to the Blackhawks for the 1989 playoffs. 1989-90 O-Pee-Chee CUSTOM card – Despite playing 20 regular season and 10 playoff games the year before, Roenick was snubbed by Topps and O-Pee-Chee, and was not included in either of their card sets. Thus, I made a custom card of JR. Here he is wearing number 51, which he wore early in his NHL career before switching to his familiar number, 27. Roenick was nominated for the Calder Trophy as Rookie of the Year, but lost to 29 year-old Calgary Flames winger Sergei Makarov. 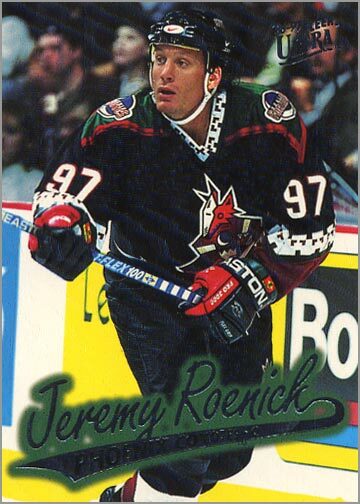 1990-91 Upper Deck – Roenick would finally receive a true rookie card–in every set that was made that year (Topps, OPC, OPC Premier, Upper Deck, Pro Set, Bowman and Panini). He would score 94 points in 80 games, and appeared in his first NHL All-Star Game in front of the hometown fans in Chicago. 1991-92 Pro Set Puck – JR would become the 3rd Blackhawks player in history to score 50 or more goals during the ’91-92 season, when he netted 53. His totals for the year was 103 points (53 G, 50 A) in the regular season and 22 points (12 G, 10 A) in the Playoffs. 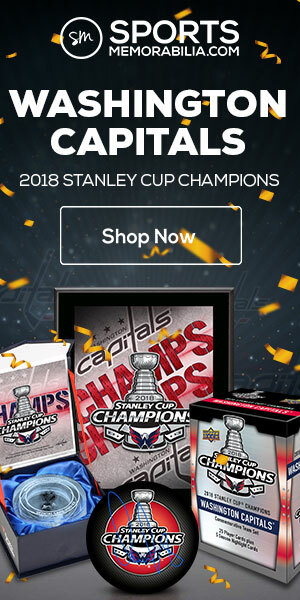 The Blackhawks made it to the Stanley Cup Finals that year, but were swept by Mario Lemieux and the Pittsburgh Penguins. 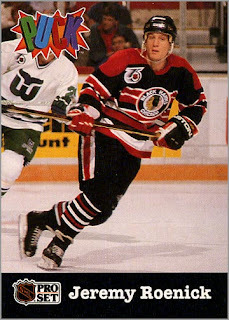 Also notice the “throwback” Blackhawks jersey, which was worn in many games during the 1991-92 season. 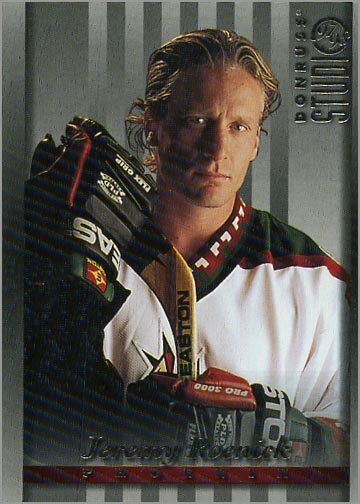 1992-93 Parkhurst – For the second consecutive season, Roenick would join the “50 Goal Club”, netting an even 50 to go along with 57 assists for a total of 107 points. This would also be his second year leading the Blackhawks in scoring. 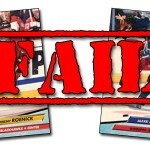 1993-94 Panini – Roenick would fall just short of 50 goals, scoring 46. But he would add 61 helpers for 107 total points, matching his point total from last year. 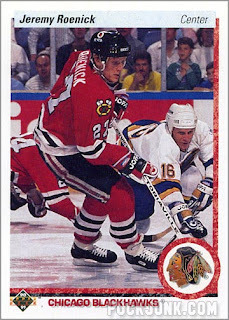 1994-95 Parkhurst Vintage – During the lockout-shortened season, Roenick would sustain an injury, limiting him to 33 games, but would still be a point-per-game player, scoring 34 points that year. 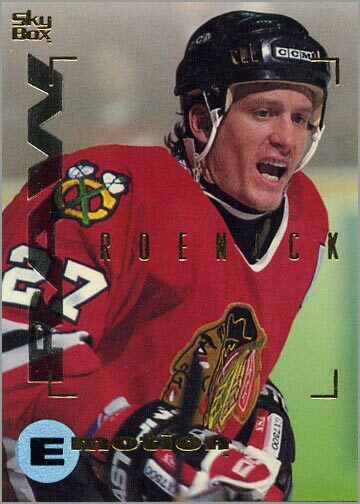 1995-96 Skybox Emotion – An injury would limit Roenick to 66 games, but he’d still score 67 points (32 G, 35 A). During the summer of 1996, Roenick’s contract was up for renewal. 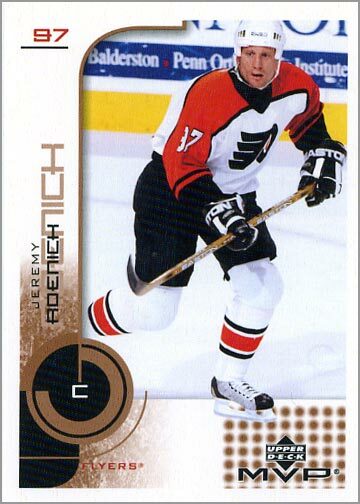 He was a restricted free agent, and was asking for $3 million a year–well worth it, considering that a healthy Roenick was a 50 goal, 100 point player; and was still a point-per-game player during seasons where he missed games due to injuries. And while $3 million would have been consistent with what other players his skill level were making, the Blackhawks instead decided to trade Roenick to the Phoenix Coyotes for Alexei Zhamnov. 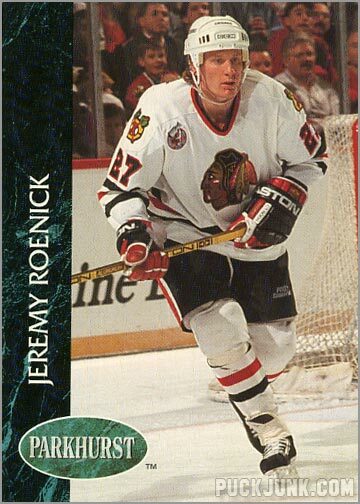 The Jeremy Roenick era ended in Chicago after 7 1/2 wonderful seasons. 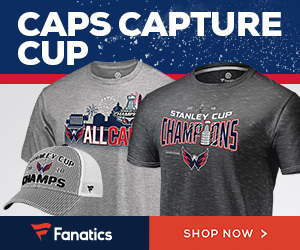 Zhamnov would hold out–and eventually receive–$3 million a year from the Blackhawks. 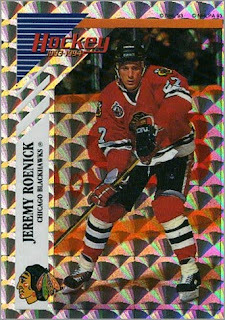 Roenick would take his show to other teams, but would never match his scoring output from his days in Chicago. 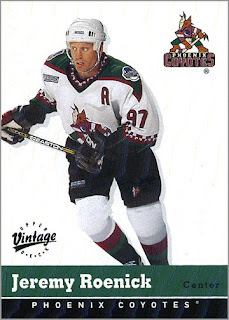 1996-97 Fleer Ultra – In his first season with the Phoenix Coyotes–which was the first year for that team–Roenick tallied 29 goals and 40 assists for 69 points, putting him 2nd overall for team scoring. 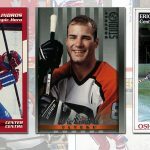 1997-98 Leaf Studio -JR scored 24 goals and 32 assists for 56 points. That put him 2nd again overall for team scoring. 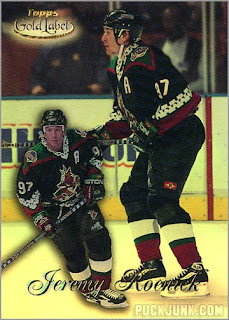 1998-99 Topps Gold Label– Roenick led the Coyotoes in scoring with 72 points (24 G, 48 A) and appeared in his 5th All-Star Game. 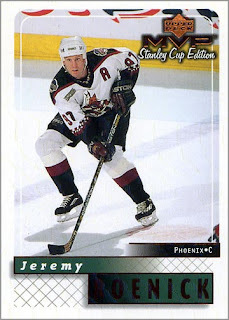 1999-2000 Upper Deck MVP Stanley Cup Edition -Another year, another All Star Game. And another year as the Coyotes leading scorer. (34 G, 44 A, 72 TP). 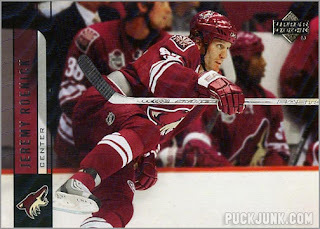 2000-01 Upper Deck Vintage – Roenick led the Coyotes in goals (30, assists (46), points (76) and penalty minutes (114). Thus ended Roenick’s first stint with the Phoenix Coyotes. A shame that such a talented player would be stuck on such an abysmal team during the prime of his life. 2001-02 Parkhurst Waving the Flag -JR signed as a free agent with the Philadelphia Flyers. 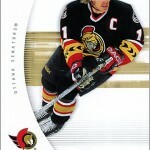 During the 2001-02 campaign, he scored his 1,000 point and played in yet another NHL All-Star Game. He led the Flyers in assists and points. 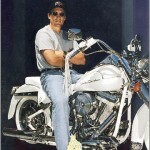 He was also a part of the U.S. Olympic team that won a silver medal. 2002-03 Upper Deck MVP – Still gong strong, Roenick led the Flyers in goals (27), tied for the lead in assists (32) and also led in points (59). He played in his 1,000 NHL game and his 8th All Star Game. 2003-04 Upper Deck Ice – A slapshot to the face–breaking his jaw–would limit JR to 62 games that season. He still tallied 47 points, and played in his 9th and final NHL All Star Game. During the skills competition the night before the All Star Game, Roenick would score 4 out of 4 in the Accuracy Shooting competition. 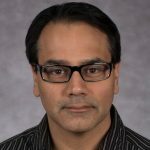 2004-05 – The year of the NHL lockout. Roenick did not play in the minors or in Europe that year. He claimed to be suffering from a concussion caused by his jaw injury the previous season. 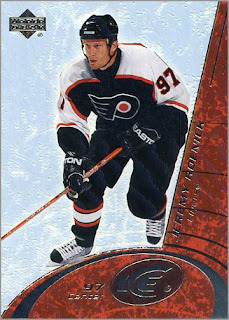 This caused some tension between him and the Philadelphia Flyers (who had to pay him during the lockout because he said he was injured). 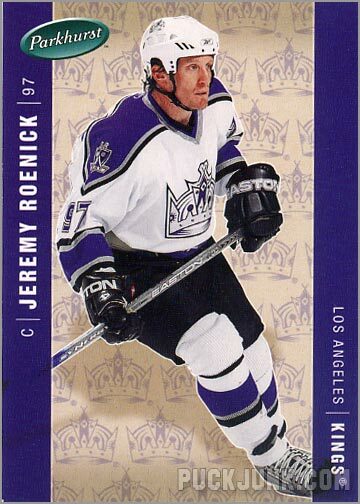 Before the next season started, JR was traded to the Los Angeles Kings. 2005-06 Parkhurst – Roenick’s only year in L.A. was forgettable, as he scored 22 points in 58 games. 2006-07 Upper Deck – Roenick was back with Phoenix, but only for one year. He scored 11 goals and 17 assists in 70 games. He also caught flack from Coach Wayne Gretzky. Roenick was a healthy scratch, so he left the arena to go to a restaurant instead of sitting in the press box with the other scratched Phoenix players. Other than the “restaurant” controversy, it was a pretty forgettable year. At this point, Roenick said he was going to retire. It seemed like it was going to be a sad ending for what had otherwise been a wonderful career. 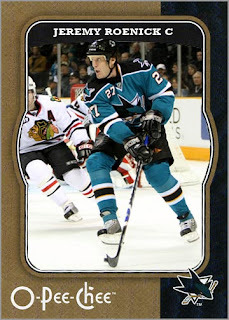 Then Sharks GM Doug Wilson called. Wilson and Roenick were roommates when they played together on the Blackhawks in the early 1990s. Wilson gave JR another chance at hockey, and probably another chance at life too. 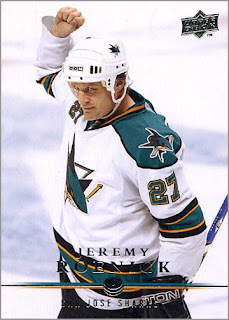 Instead of ending his career in disappointment, Roenick got to end on a relatively higher note, playing 2 more years with the San Jose Sharks. 2007-08 O-Pee-Chee CUSTOM card – Apparently, Upper Deck thought Roenick DID retire, because they didn’t bother to make ANY card of him during the 2007-08 season (other than a few jersey cards…they were probably blowing out all of their leftover ‘Yotes jerseys from the prior season). 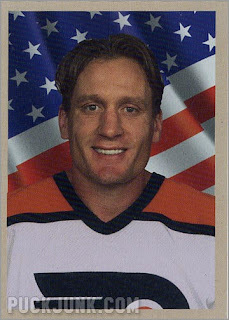 But Roenick REALLY should have had a card that year, so I made him one. 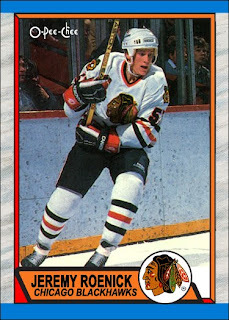 As a fourth-line checking center, Roenick tallied 33 points in 69 games, and another 5 points in the playoffs. Most importantly, that year he netted his 500th goal, making him the 3rd American player to score 500 goals in the NHL. 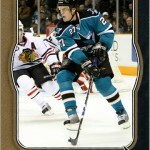 2008-09 Upper Deck – Roenick’s last hurrah in the NHL. He scored a scant 4 goals and 9 assists in 42 games. But one of those assists was his 700th. After that season, he retired. His career totals were 513 G, 703 A, 1216 P in 1363 games. 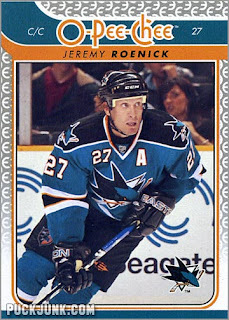 2009-10 O-Pee-Chee – Despite being retired, Roenick was included in the 2009-01 OPC set (I guess this makes up for not having a card during 2007-08). Roenick was an analyst for both TSN for NHL games, and NBC during the Winter Olympics and the Stanley Cup Finals. 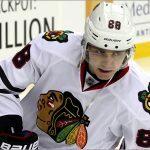 His statement after the Chicago Blackhawks won the Stanley Cup will always stay with me…. 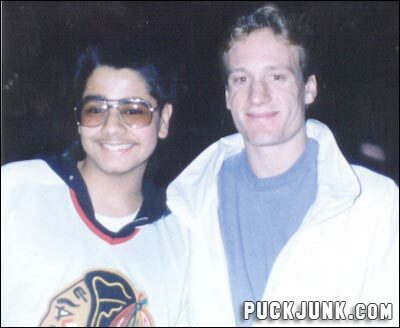 Me and Jeremy Roenick, October 1991. Does anyone know who the kid was he was talking about? In his last season he didn’t appear in 69 games but 42 scoring 4 goals and 9 assists as you said. Oops. My mistake. I’ve fixed it. Thank you. great Career In Cards page!!! !